Weekend Reading: Throat Chakra from Chakra Affirmation Cards by Mary Phelan, co-host of Telepathic TV. 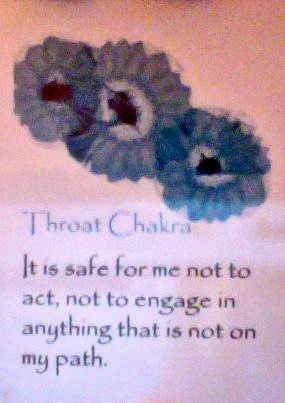 The throat chakra is about speaking up for yourself and standing up for yourself. And the affirmation on this card says, "It is safe for me not to act, not to engage in anything that is not on my path." So take those words to heart this weekend. You don't have to do it. You don't have to decide it. You don't have to say yes. The sky won't fall if you do what's right for you this weekend. You're not obligated to do anything you don't want to. When you think of whoever or whatever may be putting pressure on you, they're only focusing on their needs and their path. So that makes it ok for you to focus on yours. Try it for the weekend and see how it feels. Sometimes doing what's right for someone else's path also serves your own. But for all those times it doesn't, just say no. If you like these cards, you can get them at telepathictv.com. They're prettier than this. To begin with, they're white. And they don't have a computer screen reflecting in them. But hurry. They're in limited supply. You can also follow the links to watch Telepathic TV online. Those are words I need to keep saying to myself. I am guilty of not listening to them as a relationship started over a year ago and it didn't end well. I felt pressured but didn't have the courage to say no. Until finally I did. It was hard though. Still is. But learning how important it is. Thanks for sharing. I will check out these cards. Hooray! I'm better at it than I have been in the past.